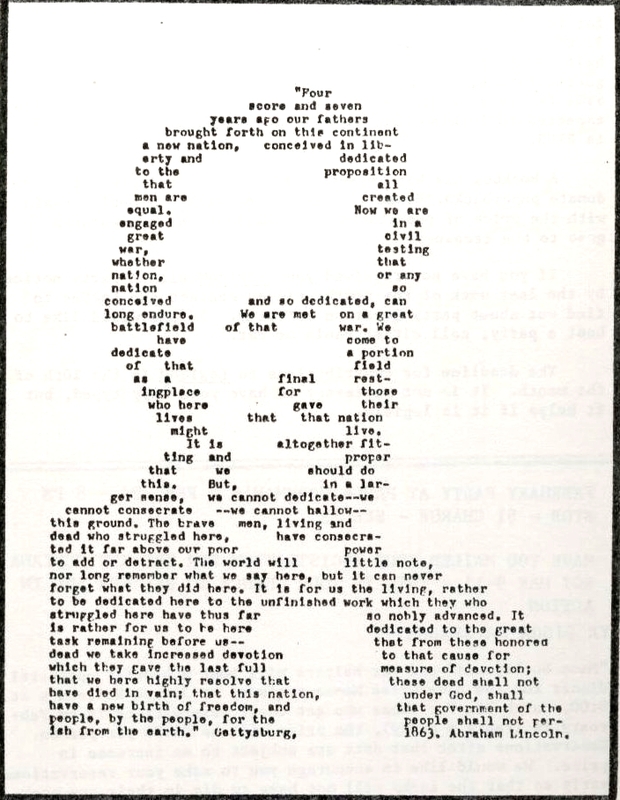 Typewriter art (an image from Joe Nickell website. Lasst revised 10/12/2014. Return to Major concepts. See also writing. We concentrate here on conceptual considerations and the state of the art. The historical development of the field is described, period after period, in our history of digital art. See notably [Laufer]. We are on the borders of digital art... but this inspirational technoloy has still its adepts. - In 2014, Jean-PIerre Marchadour exposes "dactylographies" at galerie Weiler, Paris. < The Story of my Typewriter. by Paul Auster and Sam Messer. DAT, Distributed Art Publishers, 2002. < La machine à écrire. Roger Laufer ed. Institut d'étude du livre. Solin, 1982. - The typewriter as a music instrument (humor): Youtube (Voces por la paz, 2011). - A similar kind of art was practiced on the first computer printers, whic used character bars or wheels in a mode similar to typewriter. See an example on IBM (1965 c.). Then the microcomputers became accessible to artists (mainly amateurs), with notably the Apple II, the Atari and the Commodore 64 machines. Minitel art: ad page on a city website (1985c. Teletext was a technology created in the late 1970's to add text data to television screens. Minitel was a French adventure (Wikipedia) : A small terminal, distributed freely in France during the 1980's and 1990's. It supported some forms of art, but with limited expansion due to its low resolution and communication rate. 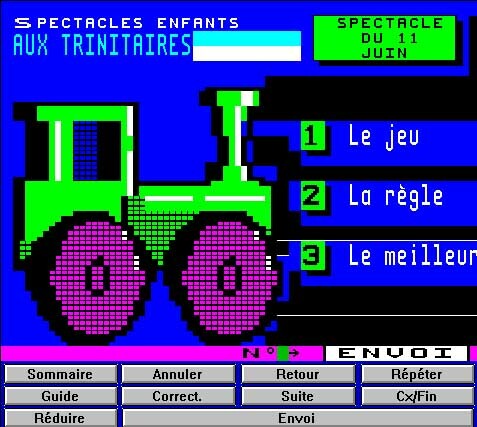 Minitel was mostly in black and white, but some developments were made with colors, allowing some "artistic" projects on websites. 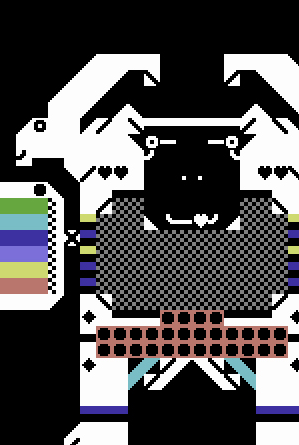 - In 2013, artist work around the good old obsolete terminal, by Plateforme. Raquel Meyers, The Yeti Sound Machine, for Memoblast 2014 festival. Image from Meyers website. We tell here of digital arts who a make a do with, or make a feature of, low resolution images, where pixels are visible. As far as we know, the first pixelized image was done by Albert Ducrocq in the early 1950's (see Ducrocq entry, with a picture). As for cinema, see Siggraph France dedicated pages. "I define my practice as keyboardslöjd (drawing/crafting by typing). My background is photography, performance, installations, video, animation, web and graphic design. "I’m interested in the mix of traditional techniques like embroidery (work-table) and old technologies from the 1970s and 1980s, like the early home computers (Commodore 64) and Teletext (Text-Tv). Both shared the grid as a framework and text characters as instructions, who becomes the essential language in my work." < L'art du dessin dactylographique by Serge Palma (1981).Tanger.